Theatrical trailer for "Queen of Spades." 8-page booklet with production notes. Anchor Bay scores again. This great double feature DVD includes a classic of the horror genre and a rarely seen gem that deserves a wider audience. "Dead of Night" is the grandfather of the Omnibus horror films which gained in popularity during the 1960s and 70s. "The Queen of Spades" is an overlooked horror gem from the Associated British Picture Corporation. 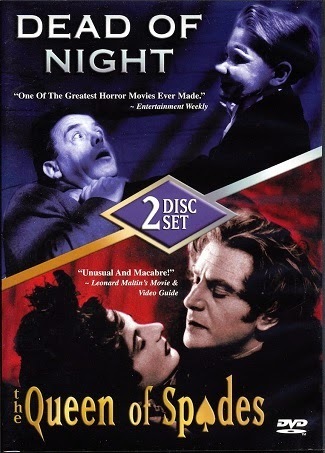 As good as "Dead of Night" is, this DVD set is worth the price for "The Queen of Spades" alone. Omnibus films are movies comprised of several separate stories tied together by a common thread. Examples of Omnibus films would be "Vault of Horror," "Tales From the Crypt," "Asylum" and George Romero's "Creepshow." "Dead of Night" is comprised of five stories revolving around a group of people gathered at a country house. An architect arrives to give an estimate for a job. He suddenly is overcome by terror as he recognizes each of the people. He realizes that something dreadful will happen to him if he doesn't leave. His hysteria inspires each of those present to tell of their own encounter with the macabre. A psychologist does his best to convince the man there is nothing to his fears or premonitions. The five tales range in effectiveness from extremely terrifying to ridiculous. The first tale deals with an ex-soldier's premonition with death. The most famous segment involves Michael Redgrave as a ventriloquist going over the edge of madness. This segment was the inspiration for the Anthony Hopkins film "Magic." For my money, the segment about a haunted mirror is the best thing in the film. The other two stories are below par. One deals with a ghostly game of hide and seek on Christmas Eve. The fifth segment is completely out of place and has been deleted from some previous releases of this film. That segment is a comedy sketch involving golf, ghosts and two men fighting over one woman. It really breaks the flow of the movie. One of the best things about "Dead of Night" is the twist ending, which, unfortunately takes place over the closing credits. Because of this weird placement of the film's final scene, TV stations have often cut away from the movie before it was over. Without the final scene, "Dead of Night" is a completely different film. Anchor Bay gives you the opportunity to experience the movie the way the filmmakers intended. I would, however recommend skipping the golf story. I think you will find the movie is much spookier without it. I had never heard of "The Queen of Spades" before receiving this DVD. What a wonderful discovery. All of my research into this movie revealed one common factor. A large number of people both raved about the film's quality and bemoaned its scarcity. Anchor Bay has taken care of the scarcity problem. I have to agree with those who sing this film's praises. "The Queen of Spades" is based on a short story by Alexander Pushkin. The story, set in St. Petersburg during the 1800s, concerns two people obsessed with winning at cards. Countess Ranevskaya (Dame Edith Evans) sold her soul to the Devil for the secret of the three cards, which will always lead to a winning hand. Years later, Captain Herman Suvorin (Anton Walbrook) seeks out the Countess to obtain the secret from her. Captain Suvorin is unlike the other officers in the Russian army in that he is a commoner. He lusts after their money and power. The driven, complex and amoral character reminded me of Harvey Keitel's performance in Ridley Scott's "The Duelists." "The Queen of Spades" is more of a character study than a horror film, but do not be dismayed, "The Queen of Spades" delivers the good in that department also. The film's card game finale is tense and exciting. One very good film and one overlooked classic. Good picture and fair sound. So-so extras. "The Queen of Spades" boasts the better picture of this double feature. Excellent use of shadows and darkness. A very moody and atmospheric film from a visual point of view. There are some delineation problems. "Dead of Night" relies more on the story than photography to achieve its frights. Unfortunately the transfer is full of artifacts from the original source material. The picture isn't to bad considering the movie is nearly 60 years old. Better than the prints you might see on the late movie. Again, "Queen of Spades" has a very good sound track, especially compared to that of "Dead of Night." I would give "Queen of Spades" an 8 out of 10 rating. The big problem is the soundtrack for "Dead of Night." The sound is flat, flat, flat. The voices are tinny for the most part. There are a number of audible pops. You can hear the dialogue, but it isn't very attractive at times. I would rate "Dead of Night" a 4 out of 10. The extras are close to nonexistent. There are two photo galleries on each DVD. A Poster and still gallery and a behind the scenes gallery. I wish Anchor Bay had included titles on the stills identifying the behind the scenes crew members. In addition, "The Queen of Spades" includes the original theatrical trailer. Anchor Bay has also included an 8-page production note booklet giving you some background on both films. Another worthwhile project from Anchor Bay. Not as good as it could have been, but still worth the price for "The Queen of Spades" alone.